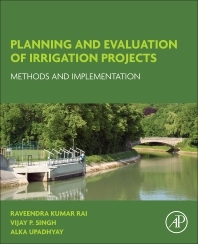 Planning and Evaluation of Irrigation Projects: Methods and Implementation presents the considerations, options and factors necessary for effective implementation of irrigation strategies, going further to provide methods for evaluating the efficiency of systems-in-place for remedial correction as needed. As the first book to take this lifecycle approach to agricultural irrigation, it includes real-world examples not only on natural resource availability concerns, but also on financial impacts and measurements. With 21 chapters divided into two sections, this book is a valuable resource for agricultural and hydrology engineers, conservation scientists and anyone seeking to implement and maintain irrigation systems. Dr. Rai has more than fifteen years of working experience in the field of Hydrology and Water Resources Engineering. His key specialty areas are: Hydrological & Hydraulic Modelling; Sediment Modelling and Management Planning, Development of Rainfall-Runoff-Erosion Models for small and mid-sized catchments; Integrated Water Resources Planning and Management; Catchment Planning, Diversion Studies; Stormwater Drainage Design and Modelling; Irrigation and Hydropower Planning; and Planning and Evaluation of Irrigation Project. Chief Environment Specialist with more than seventeen years of working experience in the field Environmental impact and management of aquatic and terrestrial biodiversity, environmental and socio-economic impact assessment of water resource projects, water quality assessment and modelling, environmental flow, biodiversity analysis; integrated water resources management, decision support system for water quality and project management. Dr. Alka has been involved in various national and international consultancy projects of varying scope in different roles funded by Central and State Governments, European Union, World Bank, JICA, and Asian Development Bank.